After leaving Death Valley, we drove to the Antelope Valley California Poppy Reserve near Lancaster, California. The park website says that poppies start blooming in mid-February, but this year the early bloomers got cut down by a frost. Finding poppies there would be a long shot, but Death Valley was too far to comfortably drive home in one day, so we stayed with our plan and saw the poppy reserve. After driving over 200 miles, we arrived at the Reserve and saw the green hills shown above. 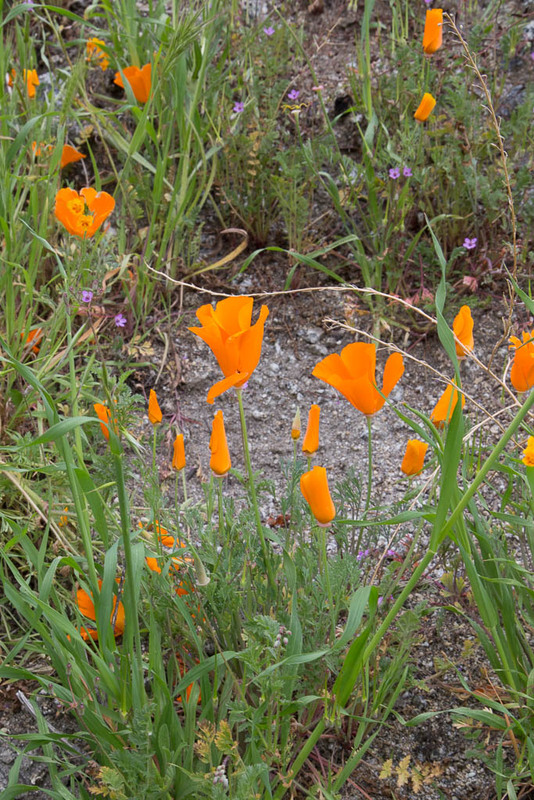 A few poppy plants are blooming on the bank next to the parking lot — poppies have orange flowers. A couple returning to the parking lot said these poppies were as good as any poppies they found in the hills. On March 10, the park service posted “generally late March to mid-April is the best bloom”, but that didn’t help us in late February. That afternoon my wife found a report of poppies in the Tehachapi Mountains. When we passed through there on our way to Las Vegas, we had seen a field of golden flowers, so we drove through there the next day on our way home. 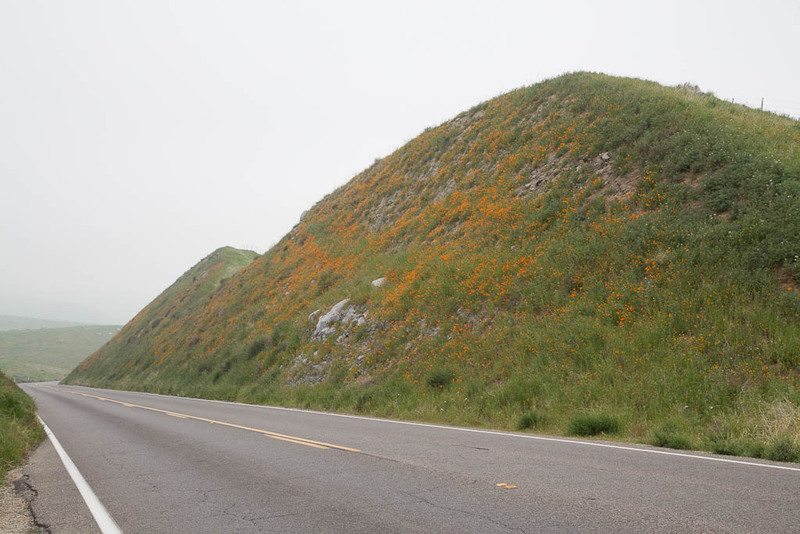 We saw some hillsides with golden flowers, but when we got closer, we discovered that these aren’t poppies. Perhaps they’re fiddlenecks. The best poppy patch we found on that February day was on a steep, south-facing cut. Poppies are more orange. Nearby fields were filled with grasses without poppies; perhaps the grasses choke out the poppies on more level ground. Closer to the floor of the Central Valley, we stopped for lupines by the roadside and found a snake that tried to cross the road. While I crouched down to take the picture of the snake, my wife watched for traffic to make sure I didn’t wind up flattened like the snake. California’s Central Valley has been transformed from desert and cotton to orchards through the use of imported surface water and pumping from the aquifer. As our drought drags into its fifth year, farmers continue to plant orchards. Almonds are a great cash crop for California, with 2012 exports worth $2.5B. But every orchard requires uninterrupted water every summer, so planting more orchards hardens the agriculture demand for water.